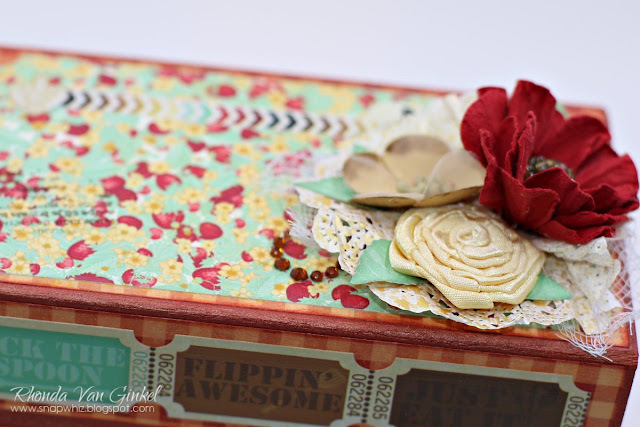 Greetings and welcome to Technique Tuesday here on the blog. I have a recipe box project for you today featuring our Kiss The Cook collection along with a few Pentart products. 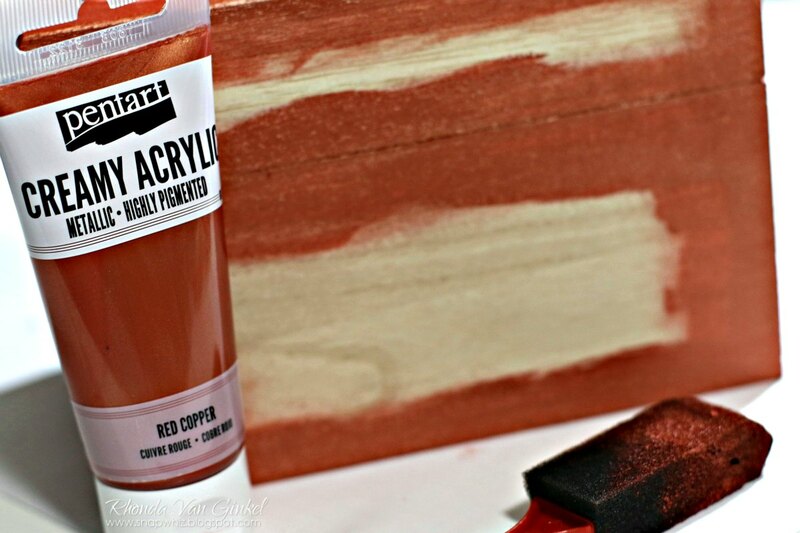 To begin, I coated the edges with Creamy Acrylic Metallic Red Copper paint. Once the paint dried, I cut each section of foundation papers and adhered. I simply embellished the layers with some Combo Stickers and a cut element of Misc Me. There is also a bit of stamping and ink splatters applied to the top and sides. I left the front of the box more clean and simple. Once my stamping was dry, I gave the box two coats of the Pentart Dekor Varnish in Matte. It perfectly sealed the box so now it can be put to use in the kitchen with no worries of splatters or clean up. I created the floral collage to give the box a bit more dramatic flair for gift giving. It's a small four inch doily, misted with Gold Glimmer Spray, allowed to dry, then scrunched up and pleated to give a small foundation for the flowers. I used our Lovely Leaf Dies to cut leaves to accent the Blossoms, then added a bit of Chocolate Jewel Flourish for some extra shimmer. 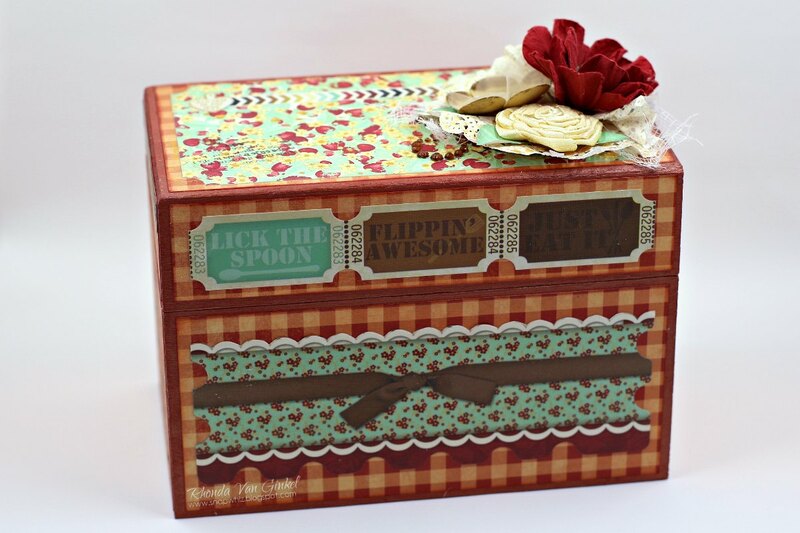 You can opt to make it a temporary decoration that can be used again to accent another gift or craft if you want a more streamlined recipe box. The Pentart Dekor Varnish worked beautifully to seal my papers and stickers to the box. The consistency is less thick than other decoupage products that I have used. It was a faster process and dried fairly quick as well. This is so cute! The flowers are the perfect finishing touch!